Still no word on the game (don't ask; no one knows), but the Red Ash animated adaptation from Studio 4℃ is very much alive and kicking. 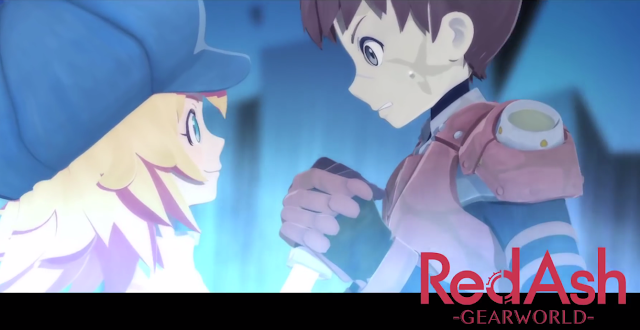 After the break, we have our first look at Red Ash: Gearworld. It's a short glimpse - approximately 12-seconds - but long enough to give us a feel of the style Studio 4℃ is going for. "In a future society where nanomachines have become incorporated into genes, the 'Nano race' who possess special abilities are oppressed and discriminated against by the "Pure race" of normal humans. Among the Nano race is the young lad named Beck, a hunter of legend who possesses the special ability of 'Red Ash"'transformation. In order to pay for the costly operation that would allow him to become a member of the Pure race, Beck and his mechanic companion, a large but timid fellow named Tyger, have taken on dangerous work zipping to the old world in their Parallel Machine. Then one day, they suddenly cross paths with a young lady named Call who is being chased by Safari and Stripe, a mysterious pair of crooks. Thrust into a mixed-up situation, together they zoom off to Gearworld, but are pursued relentlessly by the shady duo and their leader Deny, who ultimately commence an attack on Beck and his companions...!" The OVA is expected to launch sometime later this year. Not too big of a fan of CGI animations, but this surprisingly looks nice. However, the framerate seems kind of weird in some places. Not a fan of these 3D pseudo animes. I like it, Call looks cute. And I'm betting Inafune learned from his mistakes with MN9 and is purposely keeping Red Ash out of the spotlight until it's closer to complete. Games take a long time to make and the failed Kickstarter was only a year and a half or so ago (when they had literally nothing to show off except a lightly animated storyboard). I'm still holding out hope, but I don't think I'll be too upset if it falls apart either. Except he still hasn't even delievered on the stuff he promised with Mighty No 9's physical stuff and the guys who were the manufactuers have confirmed "We haven't even gotten final designs"
Damm man Its look amazing I love it! we going Metal Gear on this? Already looks better than that Gunvolt OVA. That thing was pretty bad in both animation and story. I knew it was gonna be CGI, no one is willing to put any effort on something like Red Ash to the extent of beautiful hand drawn animation. Man I really really wish Megaman X or ZX or Classic would get an official new entry buit for modern day consoles that actually push the tech. Or at least the same for Breath of Fire, but in a style reflecting the first 4 games with the exception of being generically turn-based. Basically have Tatsuya Yoshikawa be the art directer and character designer but make it an action RPG. how about they get back to fixing the whole issue with mighty no9? Ash looks cute and I like him already, man. Can't wait. Ash from Pokemon? Wrong thread bro, only Beck, Call and Tyger here. "Red Ash is such a cool guy. Eh finds the treasure and doesn't afraid of anything." I know people are still mad at Inafune for Mighty No. 9, but I have hope that he learned from his failures. Red Ash has only had scarce updates since the Kickstarter. At this point, it seems he knows to wait until the product is far enough along to be reflective of the final quality before showing it off. I hope the OVA is good, I like what I've seen so far. I never understood the stylistic choice of these full-CGI cartoons that want to look like traditional animation -- ie. they skip frames like crazy to "emulate" old-style animation. If it's done with traditional animation, it looks passable... but if it's done entirely on its own, it just looks jerky and terrible. Also, I still heavily prefer the game design of Call over the cartoon design, but mostly because she looks more like a friend of mine. She's still pretty cute either way, though. I'm not a big fan of the anime designs either. They may be little changes here and there but it still makes no sense. One of the biggest changes besides Call being white washed is how in the art on the red ash webpage Tyger has robotic legs in the game but in the anime his legs are human legs. I know that is just the original anime artwork and it seems to be changed in the short clip here but to me it feels like two completely different red ash universes. I just hope the story doesn't deviate too much from the story of the game. I'm not asking for a copy and paste story from the game but I don't want feel like I'm watching the 1994 mega man cartoon with a completely different plot point. I want to get a good feel of the red ash universe from both the anime and the game. It would look better if the framerate was higher, too weird when its that low. The actual CGI looks good though.